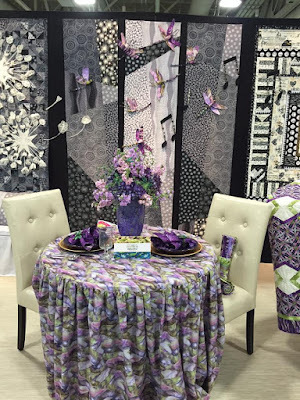 Welcome to day 2 of our three-day Quilt Market booth tour. Last weekend, we were in Salt Lake City sharing our newest fabric collections from Benartex, Kanvas and Contempo with quilt shop owners. Now we're ready to give you a sneak peek so you know what to watch for (and ask for!) 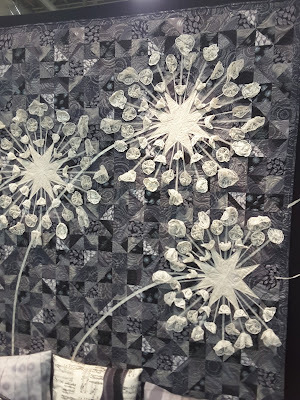 at your local quilt shops. 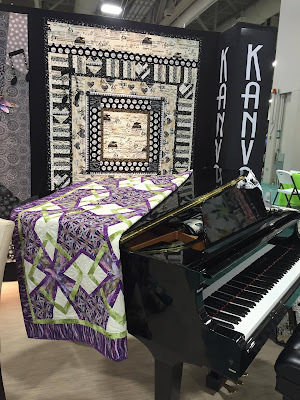 Today we're taking you on a tour of the Kanvas section of our booth from Quilt Market! 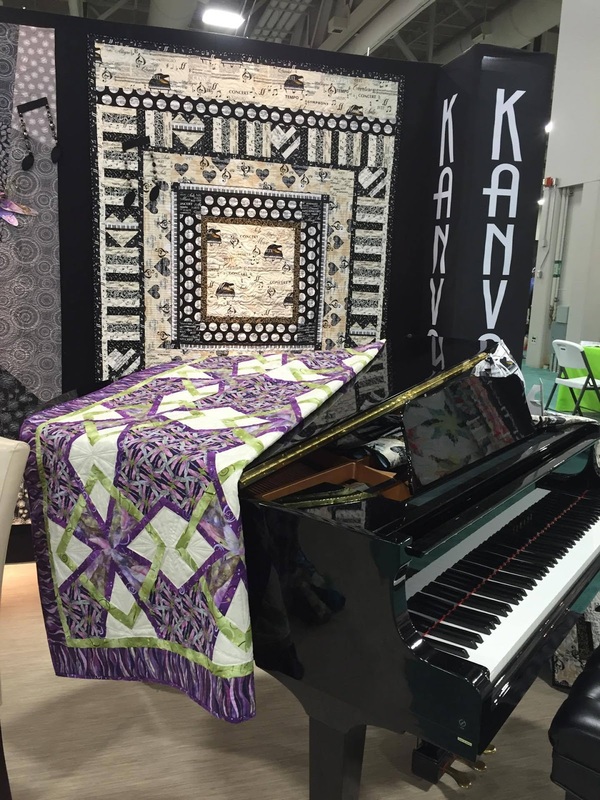 The Kanvas booth featured three lines: The Music in Me, Dance of the Dragonfly, and Nature's Pearl. No, your eyes are not deceiving you! We had a baby grand piano in the booth! 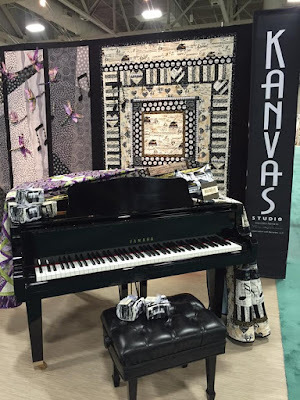 It was the perfect scene setter for The Music in Me collection. 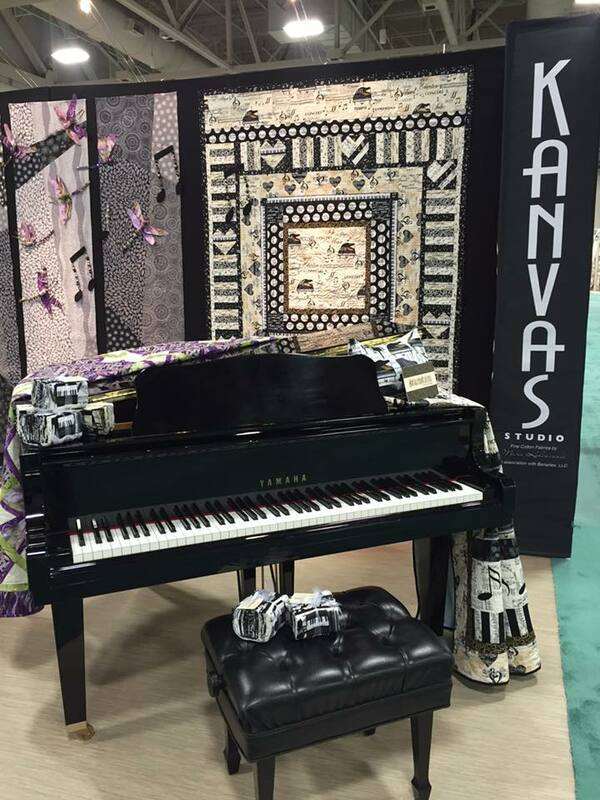 Prints include piano keys, musical notes, baby grands, and musical words and symbols, all in a classic black, beige and cream palette. Next up, the Dance of the Dragonfly collection (there's a sneak peek above in the quilt displayed on the piano!). 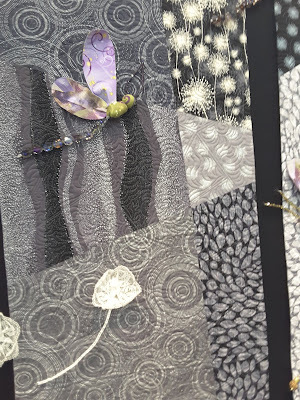 Beautiful lavenders, greens, and blues, all with a delicate gold accent. 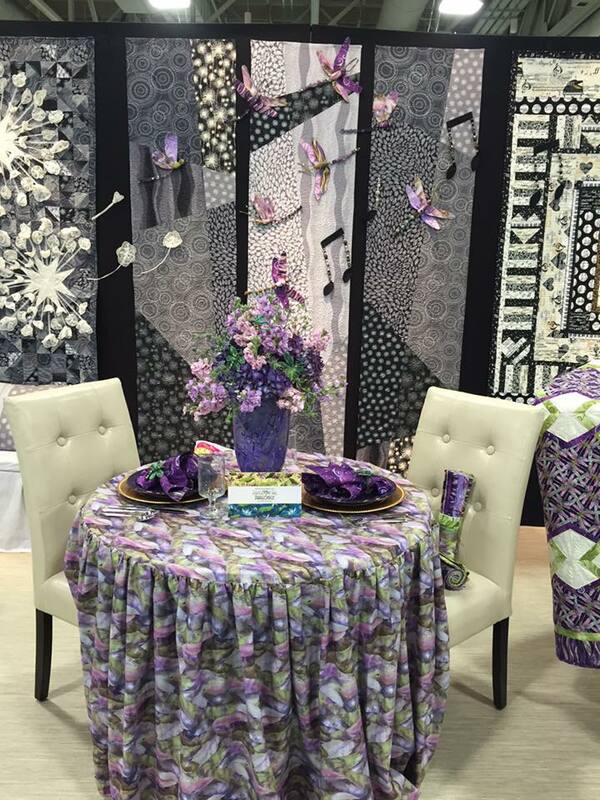 The purple colorway is shown here in the booth. Dance of the Dragonfly mixed with Nature's Pearl in the background. 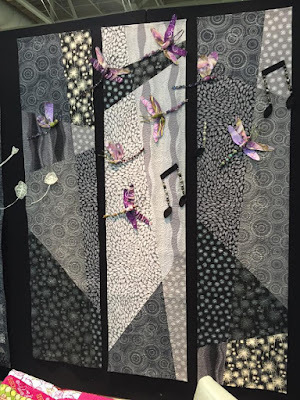 Love the detail of these 3-D dragonflies on a backdrop of Nature's Pearl collection quilts. Click here to see the entire Dance of the Dragonfly collection. Lastly, here's the Nature's Pearl collection. Black, gray, and cream prints--dandelions, swirls, dots, leaves and circles--a beautifully subtle line with pearlized accents. Closer detail on the quilt and the dimensional dandelion puffs, which are made from antique lace. 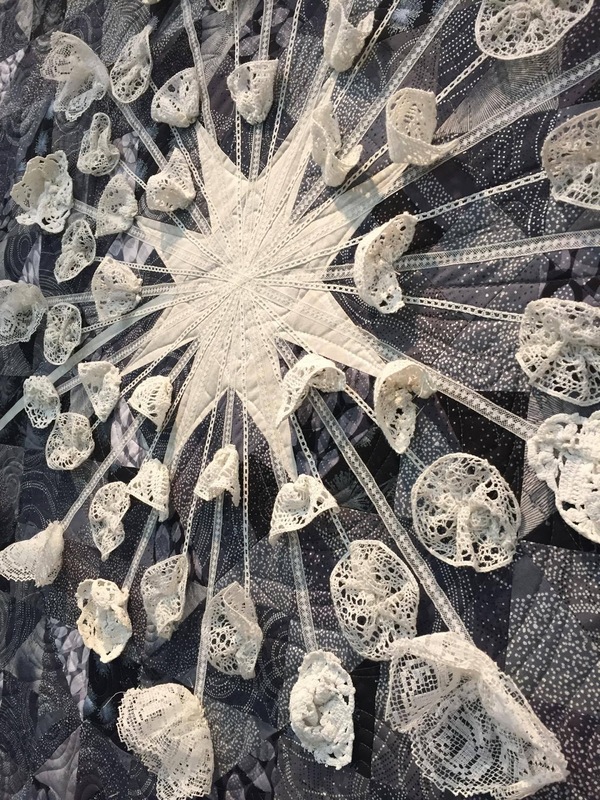 Fantastic detail on this artsy quilt! 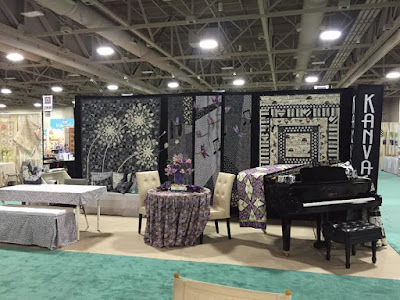 Check back tomorrow, when we'll finish our Quilt Market booth tour. 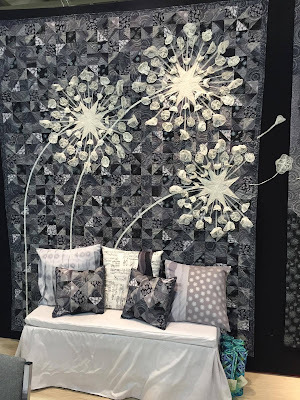 Awesome - love the dandelion puff quilt - wonderful!!!! Oh my gosh!! I absolutely love the dandelion puffs!! I've never seen such beauty in Black and White. 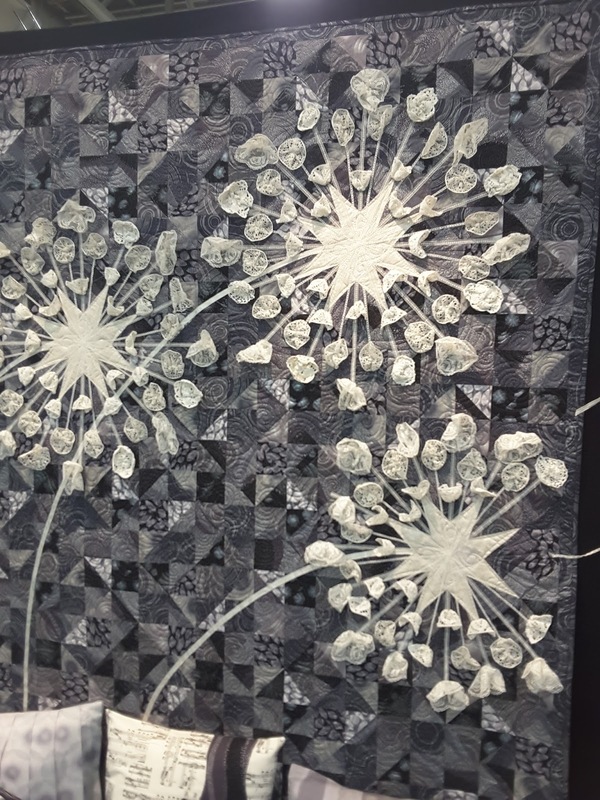 And those dandelion puffs...so beautiful and classy.